Test benches are placed on base plates that are decoupled from the ground. Therefore, the base plate is a very important part of every test bench. Test devices, frames, dynos, motors and more are directly connected to the base plate. The static, dynamic and vibration behavior of the whole test bench is significantly influenced by the base. This means that the performance of a test bench is influenced by the mass, stiffness and damping properties of the base plate. This presentation will show how numerical tools can be used to observe and improve the static and dynamic behavior of base plates for test benches. Vehicle development processes require a more modular approach in NVH engineering where simulation and testing merge. Experimental dynamic substructuring introduces a new era for testing, as measurements may serve as an input to simulation rather than a validation process. Depending on the component complexity and the prototype availability, a component model is generated either from simulation (FEM model) or test (test-based model). Experimental substructuring combines all component models to obtain a virtual acoustic model of the vehicle from, for example, the driveline components up to the driver's ear. ADAS (advanced driver assistance systems) technologies can detect and classify various objects, inform the driver of dangerous road conditions and, in some cases, apply the brakes or bring the vehicle to a stop. Installation is increasingly no longer limited to higher class vehicles. ADAS is a combination of different sensors, cameras and software. This complex network of vehicle systems must also be recalibrated during routine maintenance work to ensure that ADAS functions are all ready to run. With Mahle's intuitive, future-proof TechPRO Digital solution, ADAS is setting new benchmarks in maintaining and calibrating these driver assistance systems. Learn about the journey the centralized validation team has taken for infotainment functional and non-functional testing using different platforms. And discover/discuss the goals, challenges and next steps the team has taken. IIoT uses sensors to gather information for the understanding of usage, maintenance and operations. A Health and Usage Monitoring System (HUMS) monitors the health state of a fleet of vehicles; it also monitors the usage and targets the improvement of its availability, reliability and performance. This presentation will describe the practical use of descriptive and predictive analytics in an industrial case study, where an automotive component is monitored. This case study required the collection of usage data off the vehicle such as digital bus data, vibration, temperature, strain, etc. The challenge is to turn measured data into actionable knowledge. Electrification of vehicles is the need of the hour. Vehicle electrification brings in test challenges including high-fidelity simulations and higher-power operations. There are various building blocks of an EV such as the charging infrastructure, storage and traction – and all of them need to be tested. These tests may include performance tests of batteries, HIL validation of the BMS or software validation of the traction inverter. The partnership between NI and Opal-RT provides world-class solutions to customers, including high-fidelity simulations for validating the electric powertrain. Mobility is evolving. The evolution toward electric vehicles is without doubt a positive one for a healthier planet. Vehicle NVH testing teams are shifting their focus toward reducing the imprint of road, wind and completely new noise sources, and are challenged with new minimum pass-by noise level regulations. This presentation provides an overview of the latest innovations in Simcenter Testlab and Simcenter SCADAS for electric vehicle NVH testing. A combination of classical and completely new innovative methodologies will be presented, illustrated by real examples. Due to rising development costs in the automotive industry, innovative and cost-reducing development methods are becoming increasingly important. Validating new products' durability, crash behavior and visual requirements is essential for safety and lifecycle prediction. Optical metrology for static and dynamic deformation measurement supplies point-based or full-field information based on digital image correlation (DIC), for example, for material and component testing. This fast, easy-to-apply optical method replaces a multitude of LVDTs and accelerometers and enables visual presentation of measuring results, which makes test evaluation easy and intuitive. Furthermore, optical measurement methods allow for precise and efficient validation of simulations. When developing an over-the-road durability, benchmarking or field evaluation program, many variables can greatly affect the quality of data collected. Multi-month durability as well as short-duration, focused test drives require upfront planning as well as flexibility during the program. 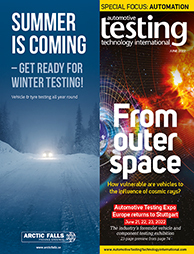 Technical as well as logistical challenges need to be addressed throughout a test program, especially when evaluating driving conditions across global markets. The presentation will discuss specific data to be collected and questions to be answered, driving route development and prioritizing test parameters, logistical challenges and driver/personnel safety training, including real-world examples from various test programs. The presentation will show how the implementation of active bonnet systems can be efficiently supported by FE simulation. The basis of the development process comprises realistic and predictive modeling of the vehicle front, including a sensor system based on silicone pressure tubes for pedestrian detection. Simulations of impacts with pedestrian dummies (coupled FE and multibody simulation), lower-limit impactor and FE models of various misuse objects (small animal, basketball, etc) are used to evaluate and optimize the detection system performance at an early stage in the vehicle development. The presentation will give insights into the impact of connected and autonomous cars on testing facilities. It will discuss the specificities and differences of connected and autonomous cars versus conventional ones. It will also outline the future of test benches dedicated to connected and autonomous cars. Recent advances in high-speed processors are resulting in digital sensors being preferred to analog systems. Druck has integrated newly available processing power into a piezoresistive pressure sensor called DPS5000 CANbus, which has a CANopen protocol enabling best quality data availability on an easy-to-interface CANbus system. This presentation explains how automotive companies who are performing on-vehicle and engine cell testing, as well as other forms of automotive testing, can benefit from the adoption of digital sensors as part of their testing systems in order to enjoy productivity improvements and reduce their cost of ownership while operating in tough environments. Everyone attending Automotive Testing Expo subscribes to the importance of testing, especially when 2-ton vehicles are traveling at lethal speeds. A core problem is that the people designing the tests are often disconnected from the people doing the tests. This problem can be mitigated by using test automation. This type of solution has long been very expensive and hard to apply when the production volumes are measured in thousands instead of millions. Today is possible to leverage open-source software, cloud-native infrastructure and off-the-shelf hardware to do robust test automation for about one-tenth the cost of competing methods. ADAS test engineers need reliable reference data for the position, range and field of view of multiple sensors on their test vehicles. This process can often be time-consuming given the number of sensor configurations on Level 3 or Level 4 vehicles. This presentation will outline a new method for validating up to 12 sensors on a test vehicle at once, each sensor having an individual range and field of view configuration. Using this method, test engineers can measure target range and visibility in real time, removing the need for expensive, complicated post-processing techniques. Vehicle manufacturers are looking to automotive Ethernet as a next-generation communication bus. This presentation will introduce the testing requirements for automotive Ethernet including current standards such as 100BASE-T1 IEEE 802.3bw. It will also discuss emerging standards such as 1000BASE-T1 IEEE 802.3bp and future variants being defined in IEEE 802.3ch and IEEE 802.3cg. Discussions will include transmitter testing, receiver testing and channel characterization. The presentation will provide a summary of how aerodynamic testing is done in Formula 1 from concept to detailed research. Wind tunnel testing had been moving toward CFD combined with full-scale, high-speed wind tunnel testing until rules put the brakes on CFD (or so it seemed) and eliminated full-scale wind tunnel work. So teams found ways to conduct effective research within these restrictions. The results are clear for all to see. For example, limiting CFD computer power has led to better software, and model tests have become races against the clock. A glimpse into the dark arts! Vehicle thermal management is widely accepted as one of the key development topics for future vehicle concepts, as it directly influences the vehicle range, component lifetime and passenger comfort. Huge effort goes into optimizing development processes to implement innovative solutions focusing on coupled CAE methodologies as well as interactive testing approaches. One drawback when it comes to front-loading during development is the inability to perform certain development and validation tasks on a testbed rather than in the vehicle itself. This presentation focuses on testbed solutions for thermal management applications that close the gap between virtual development and physical validation by taking into consideration the best of both worlds. These testbeds comprise highly dynamic conditioning units that are controlled via customer-specific CAE tools and thermally emulate heat sources like ICE or battery, or heat sinks such as single radiators or the entire cooling system of an engine. It will be shown how CAE models as well as virtual prototypes can be integrated in the testbed via an independent coupling platform, and how that approach is used to fulfill validation as well as control development tasks. One example is the use of a model that is implemented in a dynamic coolant conditioning unit to emulate the cooling system of a battery while the battery – including the BMS – is tested in hardware. By means of this approach it is possible to directly test the effect of adapting, for example, radiator sizes, pump power or cooling air inlets, etc to the thermal behavior of the battery. In the automotive industry, testing standards such as LV124 and LV148 have been established to ensure proper operation of the electronic components throughout their lifetime and all expected supply conditions. HEROpower has developed a new system: PA-LV124-148. Its main advantages are: 3x higher in-rush current, 100% power dissipation, regulation of the voltage on the DUT even at 200kHz under load, switchable power ranges, voltage and current regulation, symmetrical/asymmetrical or unipolar construction, remote control for all functions, stored test curves, and remote operation via internet and interfaces. The presentation takes a critical view and demonstrates the behavior life. The emphasis on cost within the automotive industry has gradually drifted from production to project lead time and future-proofing. DAM Group has successfully developed a novel approach for designing testing facilities. This platform approach based on an SDM (software-defined machine) enables a test bench to be stacked full of new functionalities. DAM developed HydroCore to test transmission components including the solenoid, gearbox module for DCT, CVT, AT, dual clutch and triple clutch. The company's second development, LabScript, is based on the same principle; DAM has developed its 48V rotating machine test Script, enabling complete ranges of products and applications. Water brakes have been used for a long time due to their compactness, low inertia and reliability. However, the control accuracy is usually an issue. Furthermore, water brakes are passive machines which cannot be used to drive the engine under test. Lately, the large majority of test brakes have been based on electric machines, which are accurate and can work in motor and generator modes but require an expensive and bulky infrastructure (dedicated powerhouse, wirings, drive system, etc). A solution based on the coupling of the two machines may be effective in terms of total cost and performance. When analyzing vast amounts of data, one term inevitably becomes relevant: data mining. By applying statistical methods, countless data points are processed by algorithms for the recognition of patterns, coherences and clusters, among other things. AMS – a Kistler Group company – offers a toolchain that covers the complete workflow necessary for analyzing big data – from data storage with MaDaM to parallel evaluation with jBEAM-Cluster and even including statistical analysis of these evaluation results (test-data mining). Air, carcass and compound tire temperatures have a huge influence on tire performance and durability. OptimumG president Claude Rouelle will show the results of tests performed on flat-track test benches, and explain how and why the tire temperature needs to be introduced in flat-track testing. He will also present the influence of tire models created with this new tire-temperature-dependent methodology and their influence on vehicle performance. The presentation will introduce ADwin-X, a new real-time system, as a standard version with various options, or as a fully customized, tailored version in terms of type and number of I/Os for OEM applications. OEM versions can be scaled in any number, as analog and digital I/Os, interfaces like CAN/CAN-FD, SENT, LIN, PROFIBUS/PROFINET, etc. ADwin-X has a local RT-CPU for fast and precise real-time applications with RT software ADbasic or Simulink. Measurement and control; fast open/closed-loop control; signal generation; within R&D test stands, production lines, end-of-line or HIL models: ECUs, sensors, actuators, brakes, shock absorbers, engines, transmissions, gearboxes, and vibration test stand control. ADwin is an expert with more than 25 years' experience in deterministic real-time applications. Fatigue testing of components is the key for long-lasting, high-quality products. Camera sensors are able to, for example, measure tiny deformations and strains, identify weak areas, find defects and track cracks during mechanical loading of the components. New developments expand the application range of high-resolution camera sensors to fatigue testing with up to 1kHz excitation frequency. This presentation gives an overview of the current state-of-the-art technologies, their capabilities and typical application examples. Hybrid testing is an innovative approach to combine testing with numerical simulation to provide cost- and time-efficient engineering solutions. We will show how this can be done on two use cases. The first use case is about an efficient approach for validating the B-pillar crash behavior by using numerical simulation to set up a B-pillar test bench as a replacement for a full-vehicle crash test. 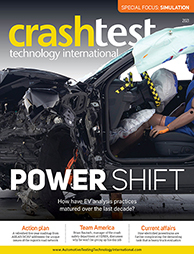 The second use case shows how numerical crash simulation can be used to extend the capabilities of active safety testing by combining them into one hybrid test.